Thie Suwai means, a beautiful place. Our house is located, with several other villas and homes, in a small residential area (Saiyoi Hills Residence). To get there it takes a few minute drive from the main road through forests and rubber tree plantations. The bungalow is built in traditional Thai style with Western comforts and conveniences. It has a nice and cosy garden with trees and beautiful tropical plants. Maybe some fruit are ripe when you visit and in the garden you may spot tropical butterflies, birds, salamanders and forrest squirls. The house has a living room with an open plan kitchen. Sliding doors in the living room give access to the terrace. In the back of the bungalow is the large bedroom with spacious bathroom. And then there is a cosy corner nook where you can have a quiet sit or read a book. 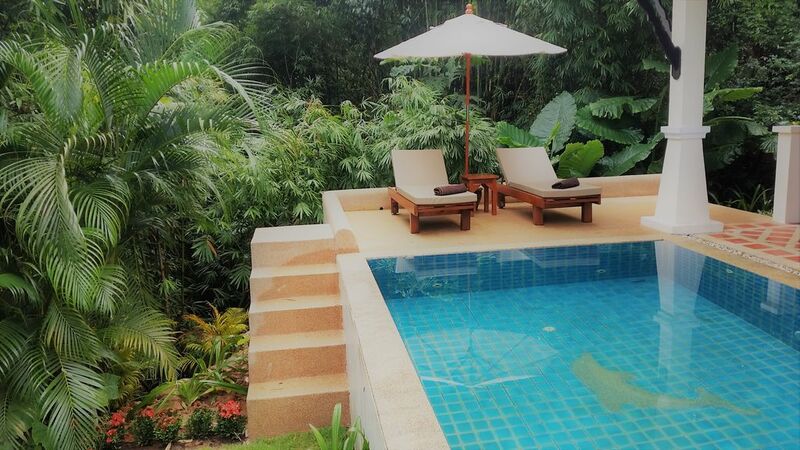 The house has a small but refreshing 'mountain' pool with reclining seat area, just right for one or two persons. Next to it is the sun deck with two sun loungers. The bungalow is tastefully decorated by Erwin, who is an interior designer, in a mix of Thai and Western style. The bungalow is our guest house that is privately located about 30 meters from our main house; villa Suwan Chang. The house is very suitable for one person or a couple, for staying in for a quiet day and as a base for a wonderful Thailand experience. Beautiful stay at ni, els and erwin.un quiet and close to nature, a small pool for us alone, the housekeeper and the pool boy are very nice.To move you need a vehicle because you are 15 km to khao lak.The bungalow is in a very well maintained park of several residences each well separated. Beautiful beaches nearby and a lot of entertainment at night in the nearby cities, really a place to recommend. Happy vacationers.Thank you to Niels and Erwin. Thank you very much for your wonderful positive review. We are so happy you had a great stay and a lovely holiday in our Thai style hideaway bungalow. We always put in a lot of effort to make everything perfect in the communication and the stay for our guests. And yes, since it is hideaway you will find a lot of peace and natural surroundings around the bungalow. You will need transport to go to the beach and Khao Lak. 5-10 minutes drive by car is beautiful Poseidon beach and 5-10 minutes drive to Khao Lak south. It was a pleasure having you as our guests and we hope to welcome you again someday. Toller Bungalow im Dschungel ! Der Bungalow mit Pool ist wie in der Beschreibung perfekt ausgestattet. Ein Fahrzeug ist ein absolutes Muss. Deutlich außerhalb von Khao Lak aber dafür mitten im Thailändischen Landleben. Pool und Roomservice erscheinen zuverlässig und leisten gute Arbeit und es war ein Privileg für uns die sehr netten Gastgeber Niels und Erwin vor Ort kennen lernen zu dürfen.